Dave is the Sports Performance program manager for UW Health Sports Medicine at The American Center. 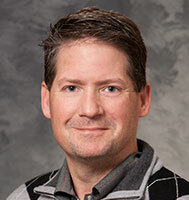 He has worked at UW Health Sports Medicine since 2005. In that time, Dave has worked to develop strategies to reduce sports injuries while improving athletic performance. He specializes in evaluating and improving human movement and performance. Dave’s professional interests include developing youth athletes, off-ice hockey performance training, coaching education, ACL injury prevention and golf performance conditioning. Prior to joining UW Health, Dave worked as a strength and conditioning coach at the high school and collegiate levels. Dave holds a Master of Arts degree in exercise physiology from Northern Arizona University. He is a certified and licensed athletic trainer in the state of Wisconsin. He is a certified performance specialist through USA Weightlifting and a Titleist Performance Institute Level 3 Medical Professional and Level 2 junior coach. Dave also coaches youth baseball, hockey and football.